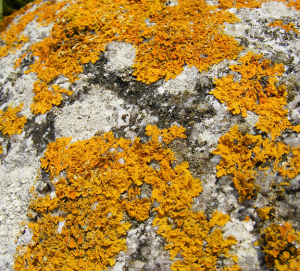 Observation - Bright orange foliose lichen - UK and Ireland. Description: Growing on a weathered granite boulder above high water mark on a west facing beach on St. Marys, Isles of Scilly, in the company of white and black crustose lichens. Growing on a weathered granite boulder above high water mark on a west facing beach on St. Marys, Isles of Scilly, in the company of white and black crustose lichens.